Tonight, I finally broke down and ordered the largest "live animal trap" that Minnesota Trapline Products sells. (Many thanks to David for putting me onto this outfit). 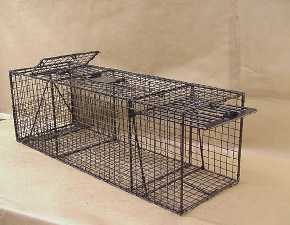 Heavy Duty Cage Traps - Dog/Coyote/Orangutans - 19" x 19" x 48" - This is our largest live cage trap. It's the real ticket for medium-sized dogs, bobcat, etc. With bait door. Minnesota Trapline no longer offers this trap, can you advise me where I can find it?